This documentation explains how to embed image zoom in your websites/apps. Sirv Zoom lets you rapidly zoom into huge images. Overall, it works like Google Maps – click the image to zoom-in, one level at a time. You can also use the mousewheel or double-tap on a touch device. Sirv is able to zoom deep into images incredibly fast by slicing your image into thousands of small image tiles. Sirv Zoom can auto-generate thumbnails for all your images. This allows you to swap between lots of your pictures. The example below has 3 zoomable images. Every thumbnail was created automatically from the original large image that was uploaded to Sirv. Any image that you upload to Sirv is instantly ready to be zoomed. Go to an image in your Sirv account and click the “Sirv Zoom” option. It’ll show you the embed code for your page. zoom-on-wheel true true / false Zoom In/Out on mouse wheel. fullscreen true true / false Enable or disable the fullscreen view. fullscreen-only false true / false Go immediately to fullscreen on click. click-to-zoom 1 0 / 1 / 2 Number of clicks to zoom in (0 = disabled). thumbnails bottom bottom / left / right / #id Thumbnail position (use #id to put them elsewhere). thumbnails-orientation horizontal horizontal / vertical Thumbnail orientation, in case positioned elsewhere with #id. squareThumbnails true true / false Enable or disable square thumbnails. contextmenu true true / false Enable/disable context menu (right-click). map false true / false Enable/disable the navigation map. mapSize 1-100 25 Size of the navigation map in percent. textZoomIn Zoom In any text Context menu text for zoom-in. 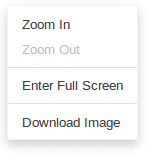 textZoomOut Zoom Out any text Context menu text for zoom-out. textEnterFullscreen Enter Fullscreen any text Context menu text to enter fullscreen. textExitFullscreen Exit Fullscreen any text Context menu text to exit fullscreen. textDownload Download Image any text Context menu text to download the image. Options can be applied individually or globally. Images look even more impressive in fullscreen. In order to enter fullscreen, click the button located in the top right corner of the zoom. See below on how to customize buttons. In the bottom right corner, a magnifier icon and “Enlarge” text is shown. Thumbnails of other images are displayed to the center bottom in fullscreen. They automatically hide after 3 seconds. A small version of the image can be shown in the corner of the picture. The map marks the position of the total image that is currently in view. This makes it easier to navigate around very large images. The map is automatically disabled on smartphones because the small screen would make it too intricate to navigate. Change the background color of the enlarged full-screen image by updating the .sirv-zoom-figure.fullscreen-mode class. You can also specify particular profiles for different screen-size devices. This is especially helpful for designing websites with different layouts for mobiles, tablets, and large desktop screens. Change the style of the buttons by using the .sirv-zoom-button CSS class. You can specify new dimensions, colors or even change the icons themselves. The number of clicks needed to zoom to the final level is determined by the difference in size between the small and the large image. Sirv automatically calculates a comfortable level of zoom: deep enough for much greater detail, shallow enough to prevent disorientation. In order to add more zoom levels, either upload a larger image to your Sirv account or embed the image at a smaller size in your page. To load images faster, you can prefetch the DNS and pre-initiate the connection to Sirv resources. This best practice recommendation accelerates page loading and is automatically applied if you’re using a Sirv plugin (Magento CDN extension, PrestaShop CDN addon and WordPress CDN plugin). In the above code, change YOUR-SIRV-ACCOUNT with your Sirv account name. The preconnect and prefetch code will connect to your Sirv direct domain, your Sirv CDN domain and the scripts needed for responsive imaging, Sirv Spin, Sirv Zoom and Sirv Media Viewer. Your images will be served as WebP images in case the browser supports WebP. Otherwise, JPEG or PNG images will be served. Image quality is 80% by default and can be adjusted. Sirv Zoom will automatically initialize when the DOM is ready. Sirv.start() – starts all instances of .Sirv on the page. Sirv.stop() – stops all instances of .Sirv on the page. Sirv.start(<#id>) – starts the .Sirv instance with a specific #id. Sirv.stop(<#id>) – stops the .Sirv instance with a specific #id. You can watermark your image by applying Sirv’s watermarking options to the URL or in a profile. Profiles can be created in your Sirv account and URL options can be added with the image customizer in your account. Sirv Zoom supports all modern browsers – Chrome, Safari, Firefox, Opera and Microsoft Edge. It is also backward compatible with many old browsers, including right back to Internet Explorer 8. This strong browser support ensures your images will zoom on virtually every browser in use today. For help from a Sirv expert, contact the support team from your Sirv account. If you don’t have a Sirv account yet, join now.